Busy catering environments are sure to appreciate the ease of this Fridge or Freezer Thermometer. A lightweight and compact tool, this high-quality thermometer can be mounted vertically at the centre of your fridge or freezer and is suitable for noting temperatures over -30oC to +40oC in divisions of 1oC. Clearly colour coded, it is easy to read by all members of staff and should be used to ensure the safe and correct storage of foods. 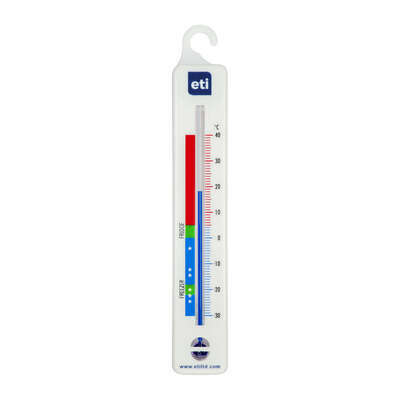 This thermometer is also compatible with most types of fridge or freezer, from commercial to residential. Keep constant track of any variation in temperatures to ensure the safety of all your residents, guests or employees with our Temperature Log Book A5.